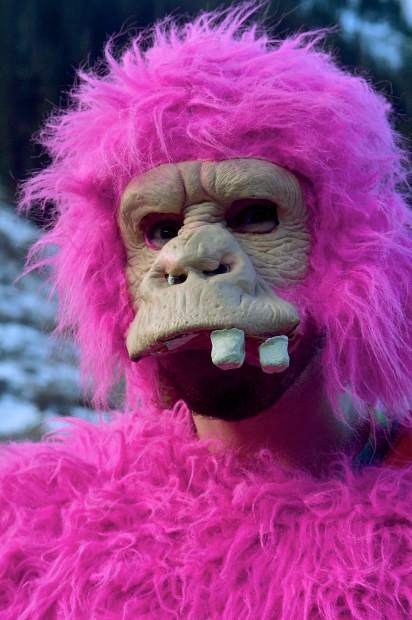 A pink monkey (aka Jamie Humphrey of Denver) before opening day at Arapahoe Basin on Oct. 21. 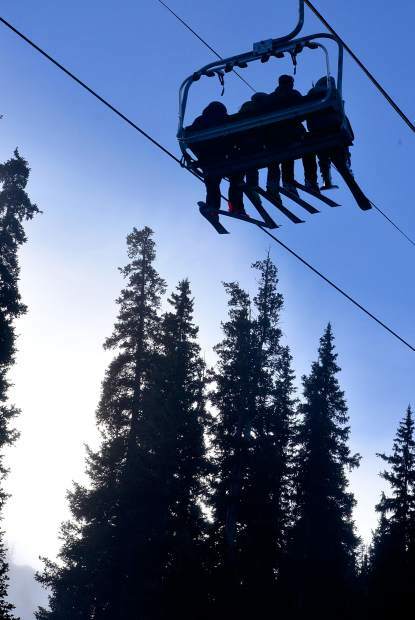 The ski area saw roughly 3,000 skiers and riders for the kick-off to ski season in North America. 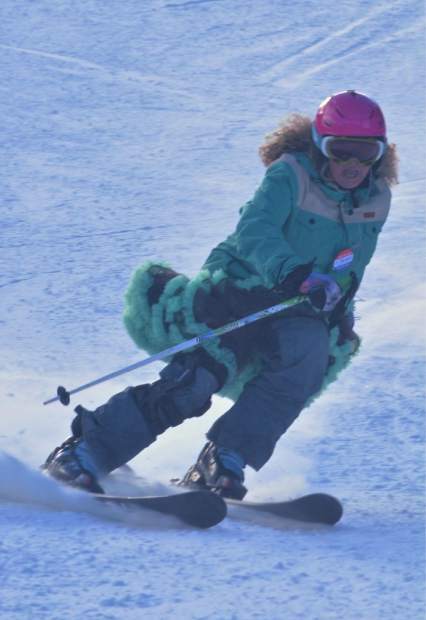 A full chair cheers for the start of ski season shortly after Arapahoe Basin opened for business on Oct. 21. The ski area welcomed more than 3,000 skiers and snowboarders for short runs (and 20-minute lift lines) under cloudless skies. 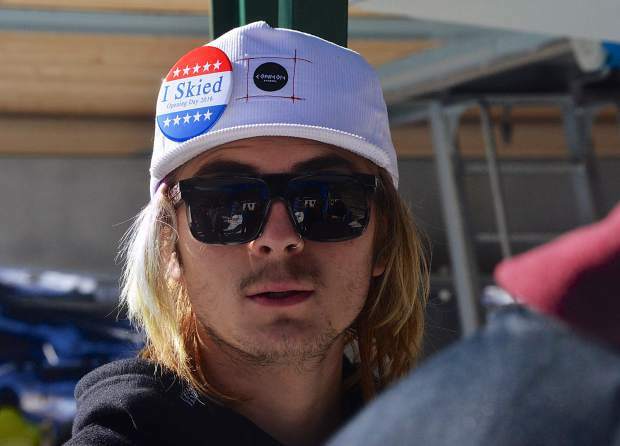 A skier wears an "I Skied Opening Day 2016" button in the form of an "I Voted" button in the lift line at Arapahoe Basin on Oct. 21. Arapahoe Basin COO Alan Henceroth (far right) holds the opening day banner for the first chair of the 2016-17 ski season before Black Mountain Express started spinning at 9 a.m. on Oct. 21. Roughly 3,000 skiers and snowboarders descended on A-Basin for a single run, High Noon, under cloudless skies. 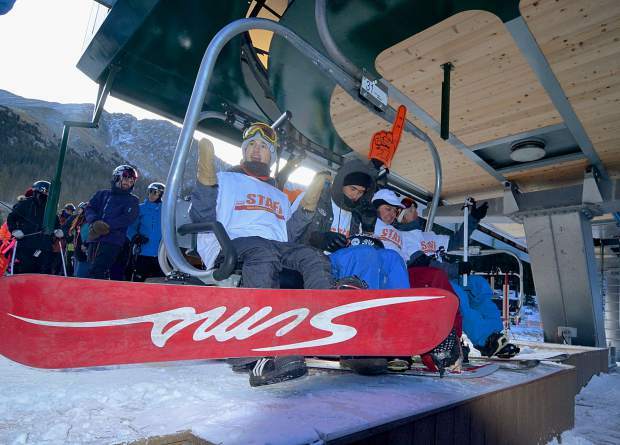 A full chair of skiers leaves the base of Black Mountain Express during opening day at Arapahoe Basin on Oct. 21. Roughly 3,000 skiers and snowboarders came from across the state and nation to welcome the start of the 2016-17 ski season in North America. 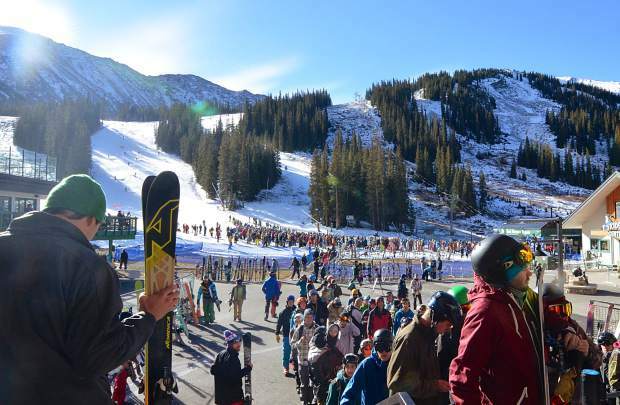 The season pass line nearly rivaled the lift lines during opening day at Arapahoe Basin on Oct. 21, when roughly 3,000 skiers and snowboarders descended on the tiny resort for the official start to the 2016-17 ski season in North America. A group of skiers and snowboarders dances for the camera before first chair of the 2016-17 ski season at Arapahoe Bason around 8 a.m. on Oct. 21. The ski area welcomed roughly 3,000 skiers and riders during the day. A snowboarder sprays a cameraman offscreen early in the morning of opening day at Arapahoe Basin on Oct. 21. The ski area saw rouhgly 3,000 skiers and snowboarders during the day for riding on a single run under clear, blue skies. The first chair crew, minus 20-year veteran Nate Dogggg, waits for the Black Mountain Express to start spinning at Arapahoe Basin just before 9 a.m. on Oct. 21. 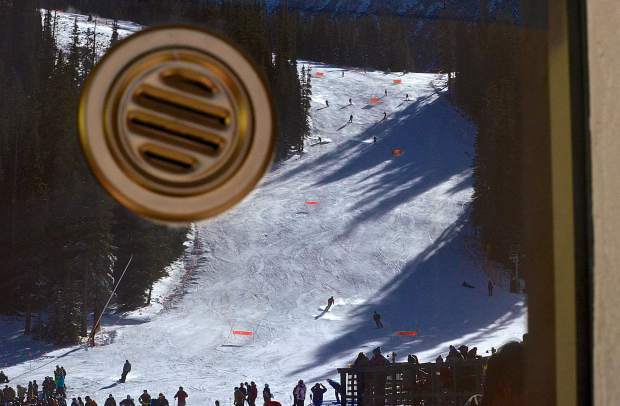 Roughly 3,000 skiers and snowboarders came to A-Basin for opening day under blue skies. First-chair veteran and Silverthorne local Justin Smith talks with a news station about an hour before loading the first chair of the 2016-17 season on Oct. 21 at Arapahoe Basin. Smith and a small crew camped out for two days before then to secure first chair. The new first-chair family (from left) Seth Hill of Denver, Tom "Trailer Tom" Miller of Silverthorne and Justin Smith of Silverthorne at the front of the line for first chair on opening day at Arapahoe Basin Oct. 21. 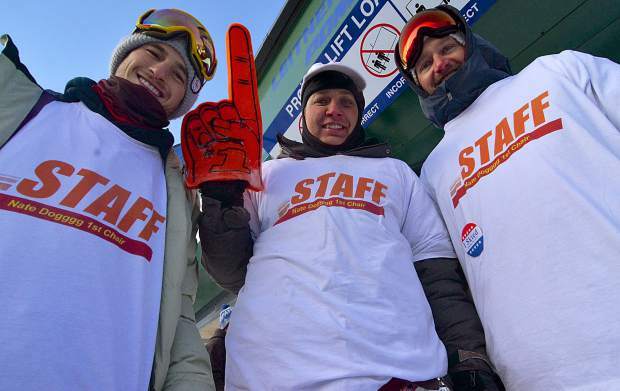 The three wore shirts for longtime first-chair veteran Nate Dogggg, who retired last year after 20 consecutive seasons on the true first chair of the season. The final pitch of High Noon and the Black Mountain Express lift line in the reflection of a ticket office window at Arapahoe Basin on opening day Oct. 21. A skier carves down the final pitch of High Noon at Arapahoe Basin during opening day on Oct. 21. Roughly 3,000 skiers and snowboarders came out for the official start to the 2016-17 ski season in North America. Source: Arapahoe Basin Ski Area. Trailer Tom and the boys have this whole first-chair thing down to a science. 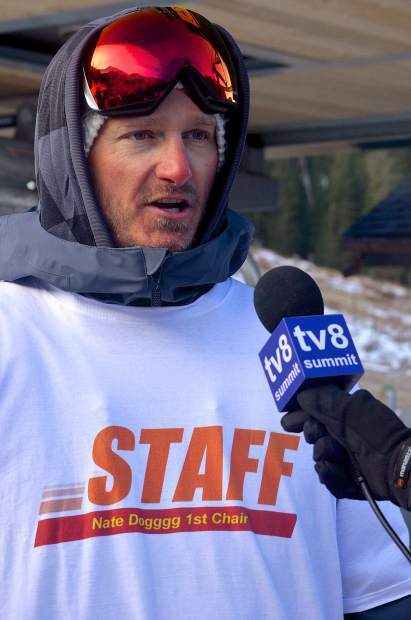 For the past 20 years, Summit County native Trailer Tom (real name Tom Miller) has joined his good friend, longtime local Nate Dogggg, and a small crew of snowboarders for the first chair of Colorado ski season — a “shred family reunion,” he calls it. This usually doubles as the first chair of the North American ski season, and so the shred family has been on TV and in print every winter for at least a decade. 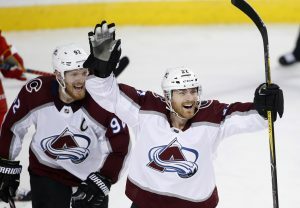 They’ve been first to load at Arapahoe Basin more than a dozen times, first at Wolf Creek for an autumn powder day, first at Loveland Ski Area when it opened five minutes before A-Basin last season, and even first at Keystone Resort under the lights way, way back in the day. October night skiing is strange, but this opening day was almost stranger. For the first time in two decades, Nate Dogggg was nowhere to be found when chair No. 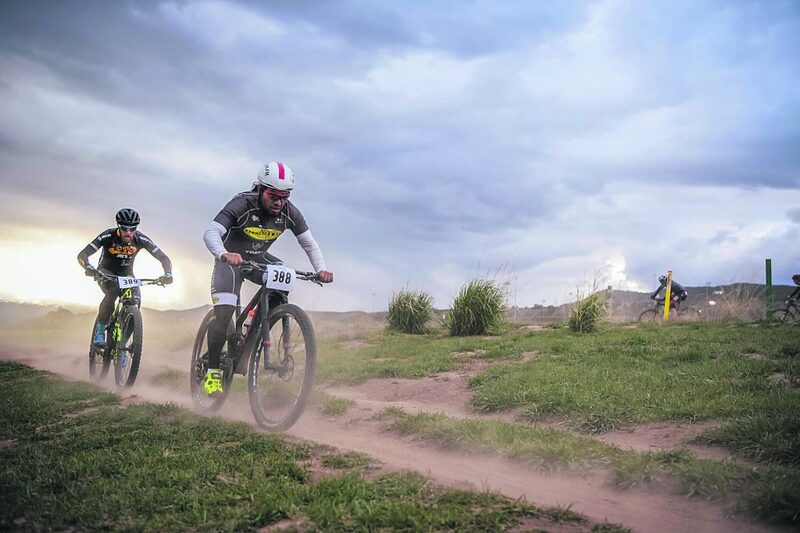 1 spun up to the base of Black Mountain Express. 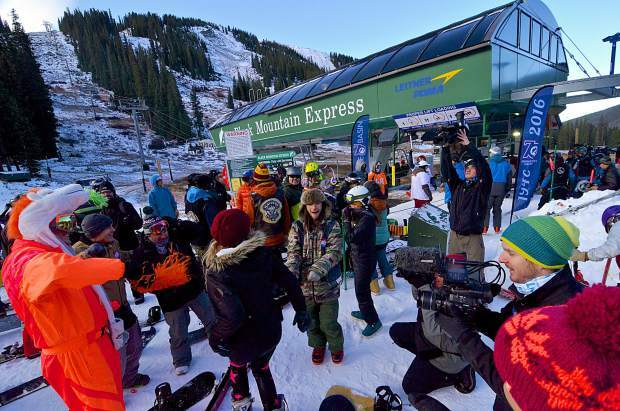 It wasn’t a surprise — he announced his retirement last season when Loveland and the Basin duked it out for dual opening days — but the gaggle of photographers, reporters and newscasters waiting for the king were still surprised and a little disappointed. After all, it was A-Basin’s 70th birthday. How could he miss it? Then they saw the shred family. The first four in line — Trailer Tom, Silverthorne’s Justin Smith, Denver’s Seth Hill and local On The Hill correspondent Z Griff — donned t-shirts reading, “Staff: Nate Dogggg 1st Chair.” He wasn’t there in person but he was there in spirit, along with the pinball machine, board games and enthusiasm the family always packs for tailgating. The king might be 1,000-some-odd miles away, but it’s not like Smith, Trailer Tom or the rest of the family are new to the routine. If scorekeepers want to get technical, Trailer Tom has recorded more consecutive first chairs than Nate Dogggg: he caught his first one 24 years ago at 15 years old — it was his first year with a driver’s license — and he hasn’t missed it since. Call him the rightful heir to the first-chair throne. What’s it take to join the first-chair family? Smith and Trailer Tom explain the rite of passage. The internet makes intel a breeze. 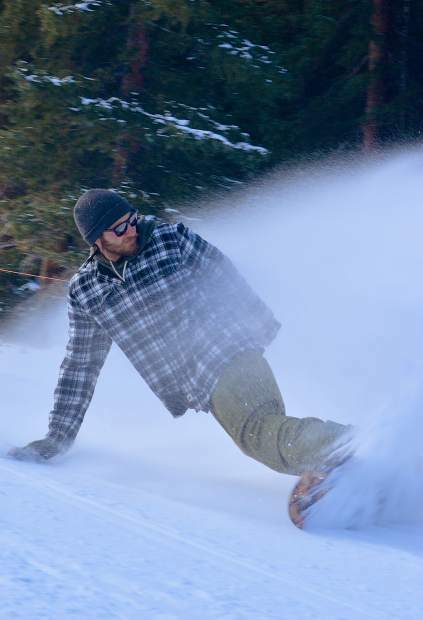 Smith and Nate Dogggg kept close tabs on COO Alan Henceroth’s web updates, known as Al’s Blog, and a new live stream showing groomers moving snow at the base area doesn’t hurt. Just a few hours after A-Basin made things official on Wednesday, Smith loaded up his truck and headed to The Beach (the dirt lot closest to the base area). Trailer Tom followed soon after with the pinball machine in his truck bed — a vintage arcade model named “Flash” — and the two dug in for nearly 48 hours of anticipation. By Thursday afternoon, the weather had warmed and the first family was busy wasting time. Smith and Trailer Tom updated social media with countdown photos between meals, rounds of pinball and snowboard-themed Monopoly. It got fierce in a way only Monopoly can: the family played four-hour games, best two-of-three, to crown a champ. The Beach stays quiet until right around midnight on opening day, Trailer Tom says, when the first row slowly fills up. A guy’s got to sleep sometime. Trailer Tom, Smith and Hill slept in shifts once other people started to arrive — but it didn’t last long. First chair isn’t as simple as pitching a tent at the lift terminal. Snowmakers are scrambling to get things ready, so Trailer Tom and family stay out of their way while keeping an eye on the front of the line. Just before sunrise, base ops wrapped up with opening-day preparations and the family sidled up to the terminal. Yes, joining the family comes with responsibility. As The Beach filled out, reporters worked the front of the line for photos and sound bites with Trailer Tom, Smith and Hill. By now, they’re naturals in front of the camera — even if they spent most of the time answering questions about Nate Dogggg’s absence. 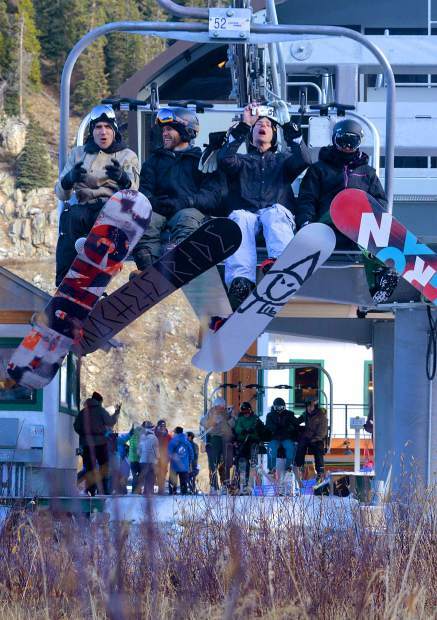 Contrary to popular belief, the first group on the first chair loaded about 10 minutes before the official opening. 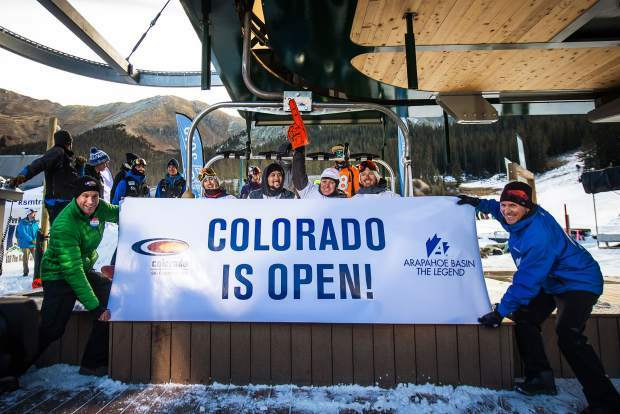 This gave Colorado Ski Country USA time to set up the opening day banner, while everyone else got more photo ops. 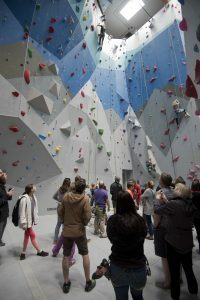 After the first run, the family usually meets up with a newscaster from one of the Denver TV stations for a final interview about the conditions. They’re never the greatest, but then again, it’s the first open run on the continent. Beggars can’t be choosers. Why wait if there’s no reward? Trailer Tom and Smith aim for at least four or five runs on High Noon, the lone open run, before ditching the crowds. Sure, waiting in line for 20 minutes isn’t close to 48 hours, but that’s comparing obnoxious apples to ritualistic oranges. Trailer Tom and the family took one final run around 11 a.m. before loading up and heading home for (presumably) showers and sleep. By then, nearly 3,000 skiers and riders were split between the lift line, the A-frame patio and High Noon.